The garden is a Permaculture design following the Linda Woodrow Mandala Garden System of a rotating chook(chicken) tractor on circle garden beds, inspired by Linda’s book “The Permaculture Home Garden”. The DMK goal is to grow tropical mountain fresh fruit & veg, following permaculture principles, employing the natural ecology of native garden predators to control the garden pests. Produce is grown naturally, chemical free and non GM. 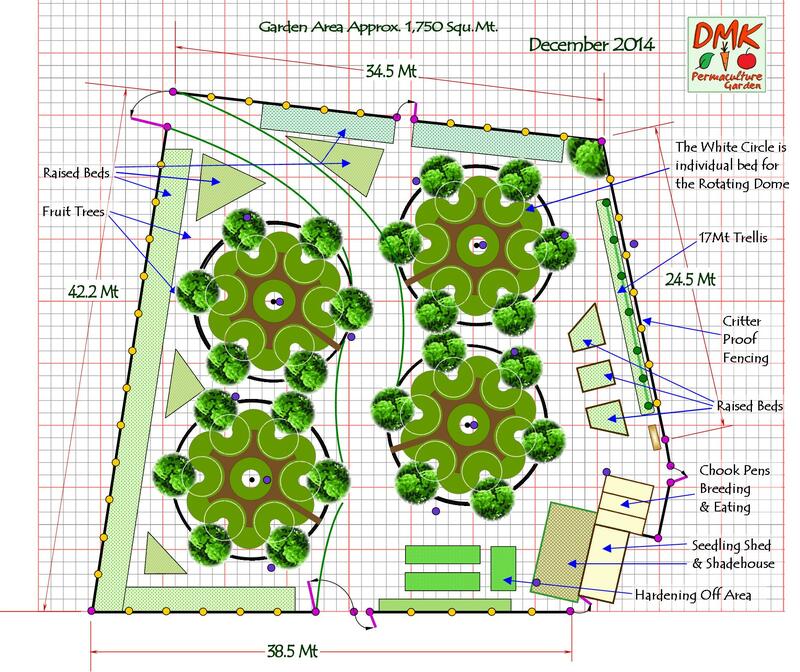 The garden plan above shows the fenced off area containing four mandalas. They are set up as two systems utilising a chook tractor each, which indexes to the next circle garden bed every two weeks, revolving around the two mandalas in a figure 8 pattern. It’s a very clever system. Substantial planning and infrastructure has been developed for our garden, including a comprehensive & sturdy Critter Proof Fence around the outside to prevent them from digging their way in, or climbing over the top. There is 17 metre long trellis bed on the RHS of the plan, with other special beds along the fences, some of which are raised, plus other raised beds filling spaces outside the mandala pattern. The bottom right of the plan shows squares representing seedling shed/shadehouse and hardening off area. Also 3 predator-proof pens next to the seedling shed where we raise young chickens for eating or selling. The fenced garden area is around 1,750 square metres, nearly half an acre. We are located 8Kms from Ravenshoe, which is the highest town in Queensland, Australia. The garden is about 850 metres altitude, (nearly 3,000 ft) 17deg south of the equator, and is nestled in dry sclerophyll forest. We are on the tropical mountains of Australia’s well known Atherton Tablelands. Due to altitude we do get a few frosts in our cool dry winter, also lots of heat & tropical rain in the wet summer. We are in the cyclone area, and survived the full impact of Cyclone Yasi (One of the world’s biggest ever in Feb 2011). Due to the unique climate we can grow Apples to Pineapples, Mangoes to Peaches, Bananas etc. and both temperate and tropical vegies, Brussels Sprouts to Sweet Potatoes, Cauliflower to Lablab. The panoramic photo above has suffered a bit of fish-eye effect, the fence in front is actually straight, and the garden area is nearly flat, rising slightly from left to right. The view in the pic above is looking south – downhill 1 metre to the bottom fence. There are two mandalas (twin circle systems) operating as the right hand side of the plan above shows. Mandalas 3 & 4 (left hand side) have the chook dome into it’s second figure 8 lap, and seedlings have been planted after the chooks have done the work. It’s a slow process to pick up the fertility of the soil during the first few laps, however we are very happy with the quality and taste of the produce from the first lap. For a pictorial history of the garden’s evolution from the start, view Garden Development page. I have just spent worthwhile time reading few hours working through your website. Must say it is one of the most well presented and inspiring sites on the subject which I have read. The care that you take is apparent in both your physical work and your explanations. I particular appreciate your description of the chook dome construction. I have built some in the past, never as good as yours, and am planning to do so again in the near future. My internet search on the subject brought me to your website for which I am very grateful, as after reading your instructions I don’t see the need to carry on searching! I wonder why there has not been any activity for a while…..? Hope all is still good with you. Cheers! I had a look & am very impressed. Just amazing. Just had a peek great work putting this web site together & awesome Capsicum & chilli relish love it.